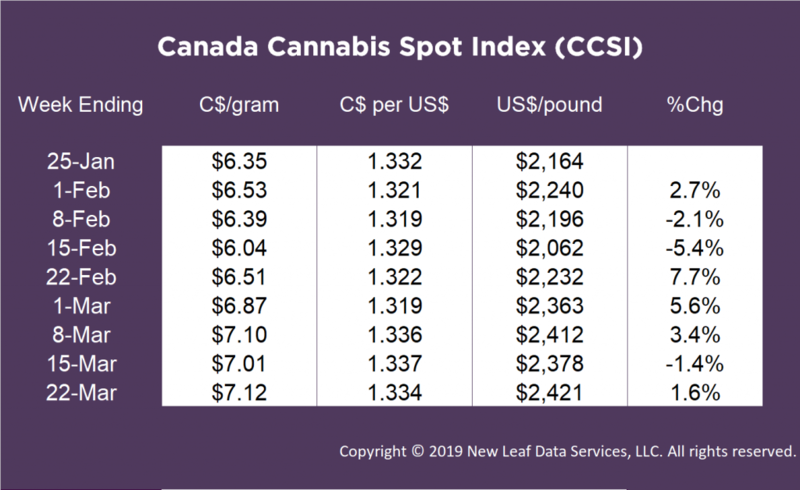 The CCSI moved higher by 1.6% this week to C$7.12 per gram, from last week’s C$7.01 per gram. 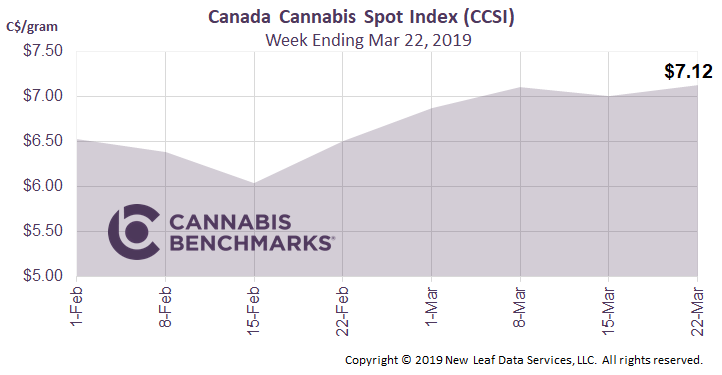 The CCSI has been quite stable over the past three weeks, hovering within a C$0.11 range. This week’s price of C$7.12 per gram equates to US$2,421 per pound at current exchange rates. This week we focus in on the size of the Canadian cannabis market. The Government of Canada did a national cannabis survey to assess the number of people using cannabis in Q4 2018. The survey estimates cannabis use of all citizens over the age of 15 by age, location, and gender. The potential size of this market is roughly 29.3M citizens. Based on the survey, approximately 4.63M people or 15.8% of Canadians aged 15+ reported cannabis use. Males were more likely to use cannabis with 20.1% reporting use, as compared to only 11.4% of females. Looking at cannabis use by age, the 18 to 24 year old population was most likely to use with 28.1% having used cannabis in the last quarter of the year. The 25 to 44 age group was the second most likely age group to use with 23.1%. Lastly, the same data was broken out by province. The four largest provinces – Ontario, Quebec, British Columbia, and Alberta – showed total usage around 13.6% of the population. The four maritime provinces – Nova Scotia, New Brunswick, Newfoundland, and Prince Edward Island – showed higher usage with 15.7% of the population in those provinces reporting cannabis use.